Maxine is political scientist as a senior lecturer in the College of Art, Society and Education, James Cook University. Her monograph , (2016) ‘Environmental Activism and the Media: the Politics of Protest’ (Peter Lang Publishers, NY), explores a variety of environmental moments from single issue (road building) to wider global movements, (such as fracking and summit hopping), historical media reporting of eco-activism and processes between social movements, the media and political mobilizations within environmental governance. A former BBC and commercial radio journalists in the UK, Maxine now publishes as an environmental journalists. 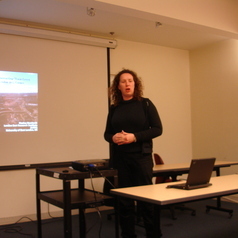 Her online journalism appears in the Ecologist magazine, TheConversation, The Age and Canberra Times.